SpartanNash’s Meredith Gremel and Rep. Brandt Iden at last year’s Legislative Reception. Don’t miss this year’s event. See page 10 for details. Not all independent grocers are going out of business. Independent grocers can still compete and win! Michigan Grocers Division Board of Directors James P. Hallan, President Michigan Retailers Association Rich Beishuizen, Country Fresh Craig Diepenhorst, H.T. Hackney Dave Duthler, AMRA Energy Jim Forsberg, Arctic Glacier Premium Ice Jim Gohsman, SpartanNash John Leppink, Leppink’s Food Centers Ken McClure, Kroger Company of Michigan Bryan Neiman, Neiman’s Family Market DJ Oleson, Oleson’s Food Stores Don Symonds, Lipari Foods Thom Welch, Hollywood Markets Jim Zyrowski, Ben’s Supercenters Michigan Food News is completely recyclable. Printed on recycled paper with soyoil-based ink. Publisher does not assume responsibility for statements made by advertisers in business competition. MICHIGAN FOOD NEWS © 2019 Michigan Retailers Services, Inc. All rights reserved. it ’s the law Reminder: Michigan’s minimum wage increases to $9.45/hour on March 29. In addition, Michian’s Paid Medical Leave Act takes eﬀect on that same date. The new law requires employers who pay payroll taxes on 50 or more employees to provide eligible employees with paid medical leave beneﬁts. See retailers.com for more information. Prepared Food Sales in Deli Provide Opportunity for Grocers Consumers are increasingly moving toward the intersection of health, convenience, and fresh — placing retail foodservice in a prime growth position, if executed correctly. However, retail foodservice growth has tapered oﬀ in recent years. This is according to FMI’s “The Power of Foodservice, Part 2.” The report aims to help grocers optimize opportunities that can drive sales growth for the total store with a focus on deli/prepared foods, deﬁned as fully or partially prepared items that are usually found in the deli. These grab-and-go or heat-and-eat foods provide convenient alternatives to cooking or restaurant/fast food. Examples are rotisserie chicken, sushi, salad bars, pizza, and more. FMI’s study reports that, while household penetration for deli/prepared food is high at 96.7%, it continues to lag the total deli penetration at 99.5%. Although there was a small year-on-year improvement for both the number of annual trips to buy prepared food, from 16.6 to 17.1, and the average basket size of a prepared food purchase, from $8.42 to $8.56, there continues to be an opportunity to convert more deli department trips to prepared food purchases. Right now, only about half of the deli trips include a prepared food purchase. Compared with categories such as produce and meat, shopper pre-trip research for retail foodservice is not common. IDDBA reports that less than one-quarter of shoppers check promotions regularly and 41% do so hardly ever or never. According to Nielsen, of all the departments across the store, deli has seen the strongest growth for chicken products. For the 12 months that ended June 2, 2018, deli represented a rise of $305 million in dollar sales and 51 million in unit sales for chicken products, the highest increases of any department. Within the deli department, growth for chicken products has come from several areas and taps into the key consumer trend of today’s shopper looking for convenience. Fully cooked deli items make up the largest share of growth for chicken products in the deli, with $138 million in annual sales growth; and smoked chicken, tenders/nuggets, rotisserie chicken and thighs are the top items driving growth for the category. Shoppers prefer an “everyday favorable price” promotion on deli prepared foods. ies are spurring the interest from these larger households; there’s also an interest in items tailored to meet speciﬁc dietary needs, such as sugar-free or gluten-free, he added. Roberts said that considering that households with children typically have younger heads of household doing the shopping, it should be of little surprise that the most frequent in-store bakery consumers are age 25-34, 35% of whom indicated in a recent survey that they purchased from an in-store bakery in the last week. Market research company IRI also provides data on the key in-store bakery shoppers. Jonna Parker, principal for IRI’s Fresh Center of Excellence, told IDDBA that their research ﬁnds that purchases by Baby Boomers and seniors add up to more than half of all fresh bakery dollars. This is due to their eating patterns, as they’re much more likely to engage in traditional meal occasions than younger generations. This impacts product assortment for in-store bakeries, which end up being the items that the older generations are purchasing. Parker told IDDBA that both younger Millennials and Gen Z shoppers index very low when it comes to in-store bakery purchases. They’re much less likely to purchase baked goods than their older generational counterparts. Who Are Your Shoppers? Successful grocers know their market and make decisions based on their shopper proﬁles. So what can grocers do to drive in-store bakery sales if their primary shoppers are younger people without children? Parker suggests the following for engaging Millennials who do not have children and Gen Z shoppers in the in-store bakery: • Focus on in-store bakery breakfast items and highlight why shoppers should start the morning with baked goods. • Key in on authenticity, transparency, and creativity — Younger generations like variety and uniqueness. And fresh can be a selling point, but they need to know how and where products are baked. In-store bakeries can do a better job marketing ingredient and baking-method transparency. • Be a storyteller — Gen Z is extremely culturally diverse and highly exploratory in their food and tastes. They present a great opportunity for bakeries to be adventurous and reinvent the types of food that they oﬀer. They’ve also only known a culture where allergens, health concerns, and transparency matter. Storytelling is essential to connect with Gen Z. • Oﬀer a variety of portion sizes — Shoppers with smaller households sometimes struggle to ﬁnd products that ﬁt their lifestyle needs. Often portion sizes are geared towards occasions and households of four or more. Some grocers ﬁnd success selling half loaves of bread as well as half pies and other smaller baked goods. • Focus on holistic health and functional food. Fresh-baked energy bars and protein-packed baked goods are underrepresented in in-store bakeries even though they are a draw for younger shoppers. MRA Member Lipari Food closed on the acquisition of Troyer Cheese, Inc., Troyer Bros. Trucking, Ltd., and Amish Wedding Foods, Inc. (collectively, “Troyer”) in February. Troyer is headquartered in Millersburg, Ohio. The opportunity broadens Lipari’s manufacturing capabilities along with expanding their portfolio of deli product oﬀerings. “We are excited about the addition of Troyer’s unique product oﬀerings into our existing portfolio,” says Lipari President and CEO Thom Lipari. “Troyer is an excellent strategic ﬁt that builds on Lipari’s heritage in deli, dairy, confectionary, and other specialty food categories. Additionally, we are eager to continue building our specialty food manufacturing capabilities and look forward to extending our geographic reach further across the Midwest.” The company says the acquisition of Troyer is a natural “next step” as Lipari continues their strategy of acquiring unique and complementary food manufacturing and distribution businesses in existing/adjacent markets. On March 14, U.S. Senators Pat Toomey (R-PA) and Doug Jones (D-AL) introduced the Restoring Investments in Improvements Act — standalone legislation to ﬁx the retail glitch/drafting error in the Tax Cuts and Jobs Act that has been preventing grocers from immediately expensing improvements to their stores. Recall that the Tax Cuts and Jobs Act made historic, positive changes to the federal tax code, including allowing businesses to immediately write oﬀ costs associated with improving facilities instead of having to write oﬀ those expenses over a long period of time. The Act included a provision providing businesses with 100% bonus depreciation, which intended to allow them to write oﬀ the full costs of short-lived investments immediately. Congress intended to help retailers invest in their businesses by the inclusion of this provision; however, some categories of business investment, most notably retail, restaurant, and leasehold improvements, were accidentally excluded from being eligible for 100% bonus depreciation due to a drafting error. Because of this error, retailers making investments to improve store interiors now face a more restrictive cost recovery period and do not qualify for the beneﬁt intended by Congress. The retail glitch has caused signiﬁcant cash ﬂow concerns and has prevented retailers from making important improvements to their stores. The Restoring Investments in Improvements Act would ensure the full cost of store, oﬃce, or building improvements can be immediately expensed as was originally intended. Senator Mike Shirkey receives MRA’s 2018 Legislator of the Year award from MRA Government Aﬀairs VP Amy Drumm. 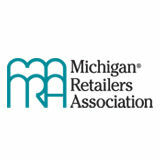 State Senator Mike Shirkey (R-Clarklake) is Michigan Retailers Association 2018 Legislator of the Year. Senator Shirkey sponsored legislation that successfully amended the onerous paid sick leave requirements that were passed to stop the issue from going on the ballot last fall. Senate Bill 1175, now Public Act 369 of 2018, made the sick leave requirements far more palatable for retailers and employers. His leadership role helped secure the necessary votes to win approval of the changes, and he created a system to ensure all parties worked together to draft the new language in a seamless fashion. In addition, as last term’s Senate Health Policy Committee Chairman, he was a tremendous advocate for retail pharmacies. He was instrumental in brokering a legislative victory to modernize language around pharmacy drug substitution pricing. This was a long-desired outcome to update archaic language and remove potential liability from retail pharmacies after a 2014 Michigan Supreme Court decision highlighted the need for changes. Now in his ﬁnal term, Senator Shirkey was elected Senate Majority Leader. He also serves as Senate Government Operations Committee Chairman. Representing Branch, Hillsdale, and Jackson counties, Senator Shirkey has been named an MRA Friend of Retail in all three of his elections (2012, 2014 and 2018). There are special numbers your players always look forward to. They pick them. They own them. They love them. They play them. Drawings are held twice a day, seven days a week, giving players lots of chances to win $500 top prizes playing Daily 3 and $5,000 playing Daily 4. 2-WAY, BOXED AND 1-OFF BETS NOT ELIGIBLE. WHEEL BET WINNERS WILL BE PAID THE STRAIGHT PRIZE ONLY AND ARE NOT ELIGIBLE FOR THE REVERSE PRIZE. Daily 3 odds: Straight: 1 in 1,000; 3-Way Box: 1 in 333; 6-Way Box: 1 in 167. 1-Off Straight: 1 in 1,000; 1-Off One Digit: 1 in 167. Daily 4 odds: Straight Back Bonus: 1 in 10,101; Straight: 1 in 10,000; 4-Way Box: 1 in 2,500; 6-Way Box: 1 in 1,666; 12-Way Box: 1 in 833; 24-Way Box: 1 in 416; 1-Off Straight: 1 in 10,000; 1-Off One Digit: 1 in 1,250. Knowing your limits is always the best bet. Call the Michigan Problem Gambling Helpline for confidential help at 1-800-270-7117.
this would interfere with the animal’s task, or the handler’s disability prevents the use of these devices. The U.S. Department of Justice has also indicated food establishments are not required to allow service animals to be placed in shopping carts or use seating, food, or drink provided for customer use only. There are penalties for false representation of a service animal under MCL 752.61-MCL 752.64. Those who represent an unqualiﬁed animal as a service animal or service animal in training in Michigan are guilty of a misdemeanor, punishable by one or more of the following: • Imprisonment for not more than 90 days. • A ﬁne of not more than $500. • Community service for not more than 30 days. If an animal is brought into your food establishment, ask the two questions allowed by law. If the handler does NOT identify the animal as a service animal required because of a disability or does NOT indicate what work or task the animal has been trained to perform, then you should not allow the animal in the food establishment, indicating the store would be in violation of MDARD’s Michigan Modiﬁed Food Code. Printed materials and signage are available for grocery stores and restaurants at www.michigan.gov/foodsafety under “Hot News.” In the coming months, MDARD food inspectors will also have a limited amount of printed materials to distribute to licensees. If you are interested in receiving printed copies, please ask your inspector. If you suspect service animal fraud, you should contact your local law enforcement agency. As always, you can contact MDARD with grocery store food safety questions at (800) 292-3939. For service animal information, contact the Michigan Department of Civil Rights at (800) 482-3604. New Fast Cash Instant-Win Draw Games Expected to Generate Excitement; Boost Sales By Brian O. Neill, Michigan Lottery Commissioner When the Fast Cash suite of games launched in July 2017, the Michigan Lottery expected them to generate excitement for players and boost sales for retailers. The Fast Cash games proved to be immensely popular with players and their performance has far exceeded our expectations. In fact, the launch of Fast Cash in Michigan was the most successful launch of the games among the many states that currently oﬀer these types of games. Since the games launched, sales have eclipsed budget projections totaling more than $133.4 million and players have won more than $95 million. Fast Cash games range in price from $1 up to $20 per play and print from terminals at Lottery retailers. To capitalize on the Fast Cash popularity, four new games are being launched on May 5th: • Bowling Bucks II – Each $1 ticket oﬀers players a chance to win prizes ranging from $1 up to $100 and 10% of the Fast Cash progressive jackpot. The Association’s Annual Legislative Reception is one of the most talked about events in Lansing — with good reason. It has a reputation for having extraordinary food, beverages, and networking opportunities. This year’s reception will be held Tuesday, April 23 from 4:30 to 6:30 p.m. at the oﬃces of the Dykema law ﬁrm which is adjacent to Michigan’s Capitol Building — making it even easier for legislators to join us! The reception is an ideal setting to build rapport with public ofﬁcials. Don’t miss what is perhaps the year’s best opportunity to share your business, economic, and regulatory concerns with lawmakers, regulators, and other oﬃcials. To be part of the reception or for more information, contact Amy Drumm at (800) 366-3699 or adrumm@retailers.com. MRA Member Tom’s Food Market closed its store in Acme on March 17, explaining that “it is no longer economically feasible to maintain operations at this location.” The Acme store opened in 1983. Employees are transferring to one of the other ﬁve Tom’s locations. Tom’s Food Market will continue to operate stores in Interlochen, Northport, and three in Traverse City. MRA Member Star Truck Rentals announced a series of promotions. Former Fleet Supervisor Jim Kennedy advances to Director of Maintenance. In this role, he will direct teams of diesel technicians repairing thousands of commercial vehicles annually. Kennedy has been employed with Star Truck Rentals since 1977. Additional promotions: Dave Donbrock, John Teunis, and Ken Herman all advance into new roles as regional managers. More News: Star Truck Rentals received a $90,000 award from West Michigan Works! to use in helping to abate the national diesel technician shortage. According to the U.S. Bureau of Labor Statistics, an estimated 140,000-plus diesel technicians will be needed by 2022 to ﬁll emerging job openings and those vacated by a retiring generation. With the awarded funds, the company opened a second job training location. Last October, Star Truck’s Flint location hosted the inaugural diesel technician training course for prospective applicants and current employees. Now participants from West Michigan and Northern Michigan can train at a new center next door to the company’s Comstock Park rental and repair facility. During each ﬁve-week course, compatible applicants seeking a career shift receive paid training toward acquiring skills as a diesel technician. Participants are also enrolled in an apprenticeship approved through the Department of Labor. Participants who are veterans are eligible to receive Government Issue funds as well. Upon successful course completion, participants will receive job placement at one of Star Truck Rentals’ 17 locations. “Financial barriers and time commitments are a large component of what holds talent back from pursuing a diesel technician career,” says Star Truck Rentals President Tom Bylenga. “We’ve done our best to tear down those walls and build a brighter future together. We’re honored West Michigan Works! values our 150-year industry commitment as we further encourage new talent.” Currently, there are only two other certiﬁed diesel technician training programs in Michigan, available at Baker College and Ferris State University. Throughout the U.S., there are just over 170 such programs. “Presently, we’re on track to have 30 or more diesel technicians beneﬁting from on-the-job paid training since we began our Star Training Academy last fall,” says Star Truck Rentals Director of Human Resources Heather Kimble. Star Training Academy participants will receive paid training at a rate of $15 an hour, in addition to an entry tool set, which is available to own through payment installments. Michigan Food News Changes New Opportunities for Advertisers  Beginning with this issue, the Michigan Food News will be published bimonthly. Look for the May/June issue in early May.  In addition to printing and mailing each issue of the Michigan Food News, it is also available online. See retailers.com. 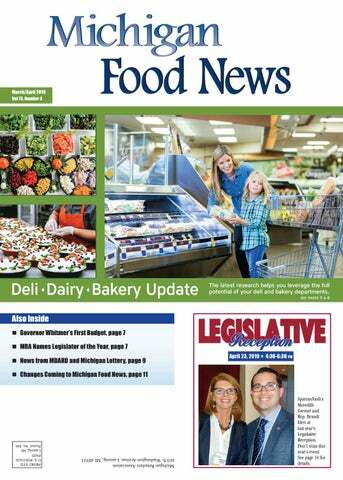 Click on “News & Events,” and then “Michigan Retailer/Michigan Food News.”  Michigan Grocers is growing its digital oﬀerings: Beginning April 2019, we’ll publish a biweekly electronic newsletter with timely industry and regulatory updates emailed to members. There is a new opportunity for suppliers to reach grocers by sponsoring this electronic newsletter.  Michigan Food News advertisers now have an opportunity to increase exposure by also placing an ad in the MRA magazine, the Michigan Retailer. If you place a full or half page color ad in the Michigan Food News, you will receive a very discounted rate on an ad placed in the Michigan Retailer. For more information on placing ads in the Michigan Food News and Michigan Retailer and to learn how you can sponsor the new electronic newsletter, contact Lisa Reibsome at (517) 449-2256 or MGAReibsome@comcast.net. A recent Nielsen study identiﬁed hot topics related to today’s food/ grocery industry and noted Americans’ level of awareness and interest in these topics. The research showed that social awareness varied widely, with no one topic tipping the majority. Buying local had the highest consumer awareness, topping the chart at 46%. It is clear that consumers are aware of the importance of buying local and continue to show a hunger for hometown, locally grown products, especially produce, baked goods, and eggs. What do consumers care about? 1. Buying local, 46% 2. Decline in bee populations, 40% 3. GMO in foods, 35% 4. No added sugar/sugar reduction, 33% 5. Antibiotic use in animal production, 32% Tie 6. Rising prices due to trade tariﬀs, 30% Tie 6. Free from artiﬁcial ingredients, 30% Tie 6. Pesticide/herbicide use in food production, 30% 7. Fair trade, 24% Nielsen says that consumers are purchasing products that matter most to them. Looking at the top topics of interest to consumers, dollar sales of locally grown/sourced, no added sugar, free from GMO, and antibiotic free products were all up during the 52-week period ending December 29, 2018. Interestingly though, despite consumers’ awareness of the decline in bee populations, dollar sales of bee byproducts such as food items with honey in them have grown by 39% over the past year. ;IŨVITVSYHXSSƉIVXLI3YV*EQMP] FVERHXSMRHITIRHIRXVIXEMPIVW -XŨWEFVERH]SYVGYWXSQIVWGERXVYWX WE GUARANTEE IT! Our Family® anchors a broad portfolio of private brand items currently provided to retailers like you. The March 2019 issue of Michigan Food News, the official publication of Michigan Grocers, a division of the Michigan Retailers Association.